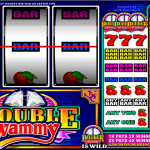 Double Wammy is a video slot game brought to us by Microgaming. A simple, classic slot that takes us back to when times were simpler and money had good value. The game offers some effortless spinning action with a dash of class. This is a very simple slot, perfect for times when you need to unwind and play a classic slot, without distracting features. Bright red cherries, BAR symbols and diamonds take us back to basics. The symbol with the game logo has 2 diamonds which add to the glitz and glam of this game. When it comes to special features Double Wammy stays true to classic slots. It has only one pay line and one special symbol, the wild. The wild symbol substitutes for every other symbol in this game. If you manage to land one symbol it will double your win, and 2 wilds will quadruple your win. 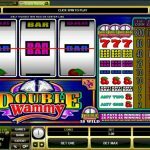 We know that there are more complicated games with features that are so unique and intriguing; others that have progressive jackpots that offer life changing wins, and then we have games like Double Wammy, simple yet entertaining. These kinds of games are timeless, and we can bet that they will never go out of style. Microgaming created Double Wammy having in mind nostalgic slot players. There are times when we need something simple to play just to unwind and forget about all our troubles. On the other hand, this is the perfect game for new players, the ones that have not experienced the thrills that slot games can offer, just so they can get the idea of how things work. The only advice we can give is to play with all 3 coins in order to land bigger wins. What another great 3 reels slot? Then you should consider playing Double Magic a 3 reel slot by MicroGaming.